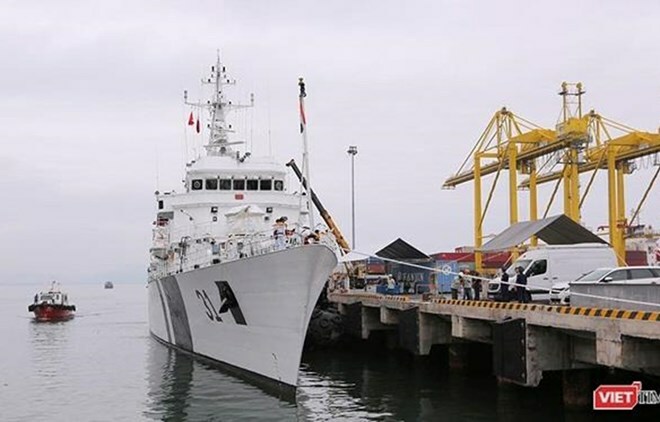 Da Nang (VNA) – The Indian Coast Guard Ship ICGS VIJIT docked in Tien Sa port on April 1, starting its four-day goodwill visit to the central city of Da Nang. The welcome ceremony for the ship and its 140 crewmembers led by Colonel T.Ashish saw the presence of representatives from the Vietnam Coast Guard High Command, the Military Zone 5 High Command, the municipal Border Guard Command and Military Command, and Indian defence attaché to Vietnam Varandan Kumar. During the stay, the Indian delegation will pay courtesy calls to leaders of Da Nang city, the Military Zone 5 High Command, the Coast Guard Zone 2 High Command, join a volleyball game with officers of the Coast Guard Zone 2 High Command, and visit Da Nang city, Hoi An and My Son in the central provinces of Quang Nam. They will hold a joint search and rescue drill with the Vietnam Coast Guard.